Every black friday I end-up spending significant amount (mostly on gadgets) to take advantage of the awesome deals. Some of those gadgets are so good, I feel that I would’ve bought it even at the original price without discount. Getting high quality product on a discount just makes the deal that much sweeter. I would like our readers to feel that sweetness on black friday. 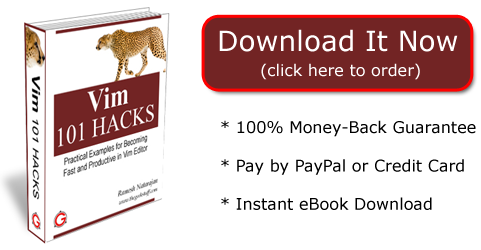 I’m giving a huge 40% discount on Vim 101 Hacks only for the 1st 50 buyers from now until Friday night 11.59 p.m pacific time. Only for this black friday deal, I’m giving a huge 40% discount, which is available only for the first 50 buyers and expires on Friday night 11.59 p.m pacific time. What is Vim 101 Hacks? 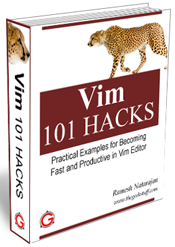 Vim 101 Hacks is a downloadable eBook that contains 101 practical examples on various advanced Vim features that will make you fast and productive in the Vim editor. Oooh! Was I first to take advantage of the deal? LOL. Nice book. Always nice to see new books on VIM.